Brash's Cabin is the home of Brash, and is located in Kremwood Forest in Donkey Kong Country 3: Dixie Kong's Double Trouble! In the Game Boy Advance version, his location was renamed to Brash's Stadium, and was repurposed as a stadium. Aside from the different background, Brash's location has the same purpose in both games. When Dixie Kong and Kiddy Kong first arrive at Brash's Cabin, Brash boasts about his record of 1:15 in Riverside Race. If the Kongs beat this time and revisit Brash, he becomes furious and throws a tantrum. The tremor causes a nearby log to fall into the river, and get stuck downstream. 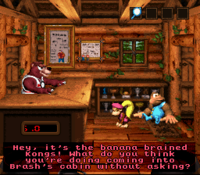 The Kongs can use the log as a bridge to the Banana Bird Cave, Arich's Hoard. This page was last edited on February 27, 2019, at 01:22.